*Yaaaaawwwwwn* Holy cow, I am so sleepy today! I blame yesterday..lol! For those of you wondering about yesterday's tackle, it turned out just fine. In fact, in some ways, it was as if 15 years hadn't gone by. We met up at Denny's and just hung out there for hours and hours and hours, talking. In fact, it was something like 1:30am before I crawled into bed. Sadly, I'm starting to think I'm getting too old to be out that late..lol! 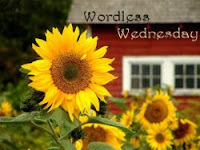 Now, I know that you all also want to know the theme over at Sunday Shutterbugs. Really guys, you could just go look yourselves. *grins* This week's theme is Eek! The girls, as always, have some incredible photos. I am always in awe at their skills with a camera. Thank goodness, they let us amateurs participate as well! This is Marmalade. 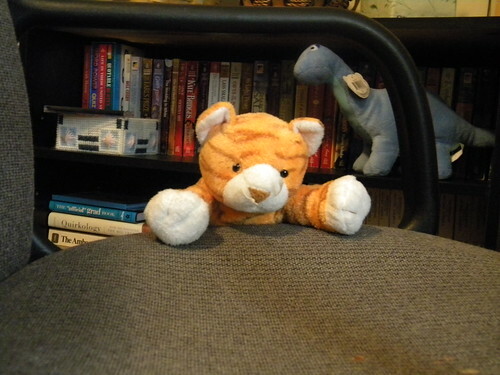 He's our new orange kitty and as you can see, he was having some problems climbing up onto the desk chair. Don't worry though! Mr. Bronty reached out his long neck and helped him finish climbing up there. Marmalade is the newest edition to the Baa & Friends gang. For more information about them, check out Baa & Friends. Not all of it is currently viewable because our account expired, but hopefully that will be corrected soon.